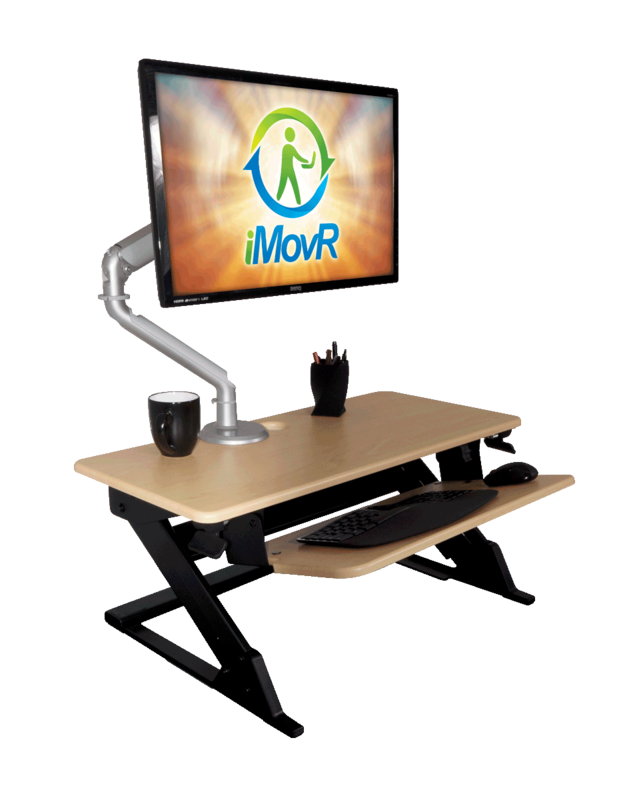 Desktop converters have become a very popular alternative to full-sized sit-stand desks, and iMovR makes a broad array of models to suit all the most common workspace needs. This guide will help you choose the best style of desktop converter for your office space. 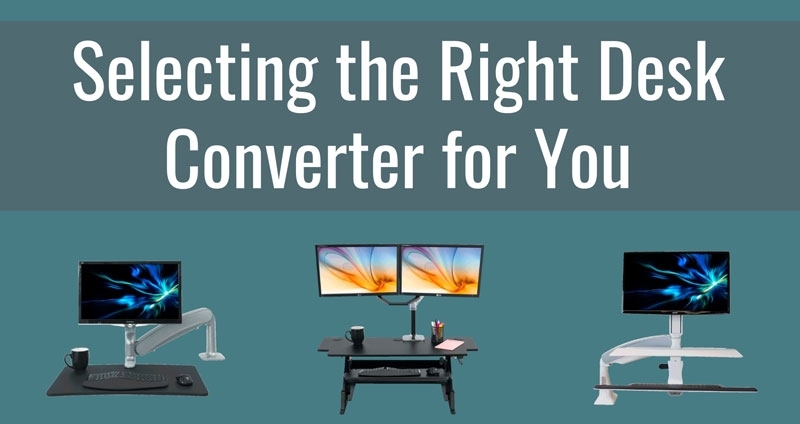 Why choose a desktop converter over a full standing desk? The most common reason is budgetary. The smallest desktop converters cost about half as much as the smallest electric sit-stand desks. Some users’ desks are built-in and they have no easy option for removing them. Others need frequent access to their desk drawers and don’t want to buy a file cabinet in addition to a new standing desk. Whatever your workspace, if you’re uncertain about whether a standing desk converter is right for you, please don’t hesitate to call us or ping us in live chat (bottom right-hand corner of this screen) to speak with a highly-trained workplace wellness solutions expert. What’s a “Z-lift” versus a “Hovering” desktop converter? "Z-Lift" and "Hovering" refer to the architectural style of a desktop converter. Depending on your workspace setup, you'll likely prefer one style over the other. 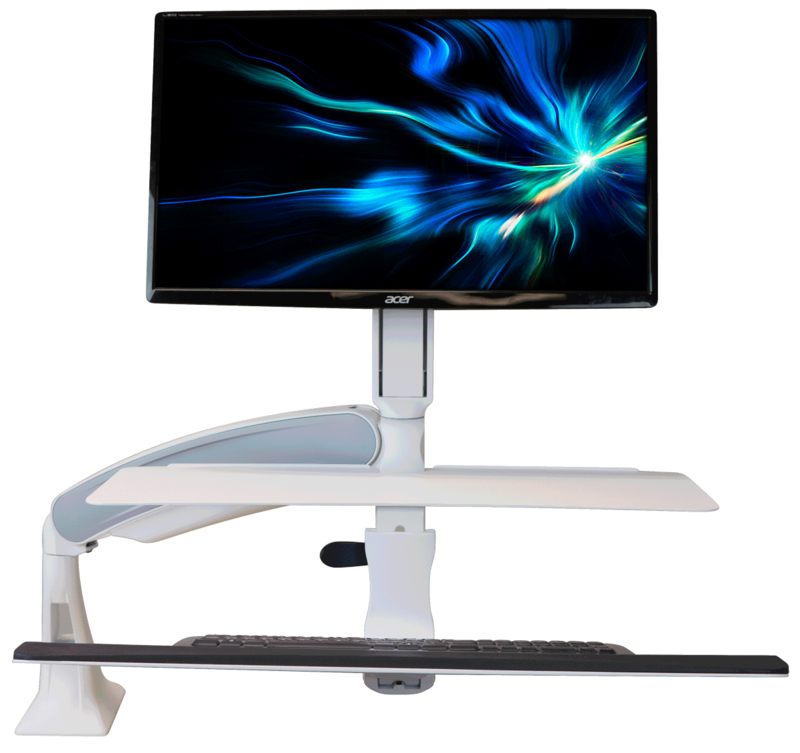 Our entire line of ZipLift standing desk converters is built on a “Z-lift” frame, which uses dual, silent air pistons to assist the user in lifting their desk to standing height. The chief attribute of Z-lift mechanisms is their astounding stability. Even at full height extension for a 6’7” user, the ZipLift is as rigid as granite. Compared to other Z-lift converters on the market (e.g. 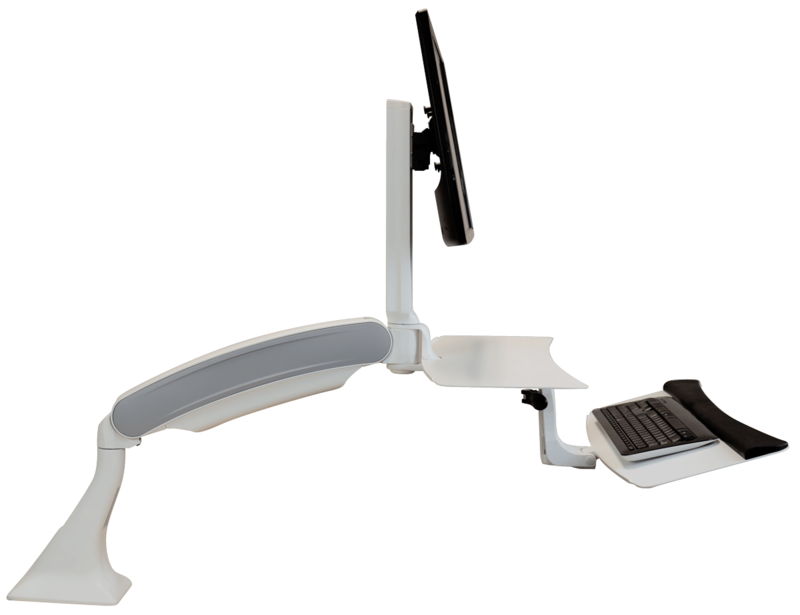 Varidesk), the ZipLift is far more ergonomic and stable. It features a tilting keyboard tray for typing comfort, and a greater height adjustment range, all while being smaller, lighter, and significantly less expensive. The ZipLift has infinite height settings as opposed to using “detents” every inch or two and a noisy spring mechanism. All ZipLifts include a FREE 18” x 24” EverMat portable anti-fatigue mat and FREE shipping. The original ZipLift+ is still our most popular unit, with 35.4” of width, a 15-20 lb counterbalance force and 35 lb total weight capacity*. Ideal for single monitors or up to 24” dual monitors. Available in Black or White finish. ZipLift+ HD is similar to the original unit but has 42” of width, a 20-25 lb counterbalance force and 40 lb total weight capacity. It is ideal for larger monitors (e.g. iMacs and all-in-one PCs) or dual 27” monitors. Available only in Black finish. ZipLift+ HD Corner is similar to the regular HD but features an even larger surface area. It is designed to fit in the corner of a cubicle or L-desk. Available only in Black finish. ZipLift Patriot is similar to the ZipLift+ (35.5”) but made-in-America with iMovR’s exclusive 3D-laminated work surfaces in a variety of stunning finishes, including woodgrains. This is the most popular unit for military and government customers, as well as patriotic consumers. Hovering converters are essentially giant monitor arms with keyboard trays and work surfaces attached to them. They are ideal in situations where the user has a lot of paper flow and needs easy access to their entire desk surface at any time. The drawback of hovering converters is that they are inherently less stable than the Z-lift architecture, but in return you get to use virtually your entire desktop by simply pushing away your computer. The Cadence has every ergonomic adjustment conceivable, and an impressive 52” radius. 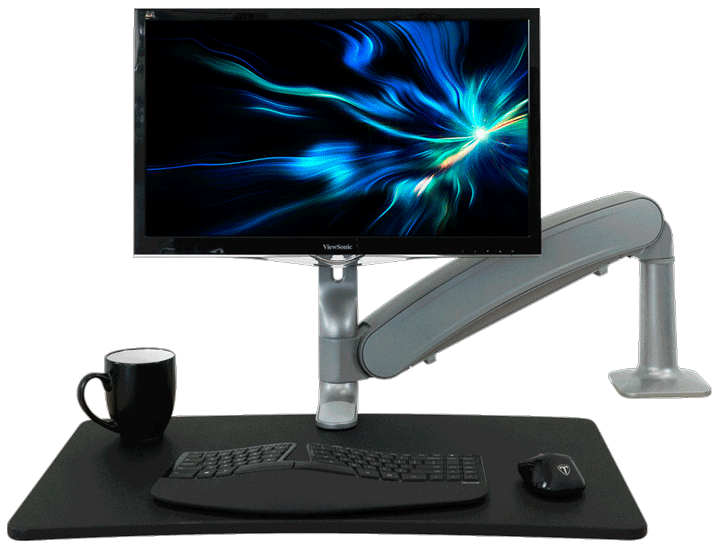 It is heavy duty, able to handle single or dual monitors, and has an extra work surface for holding papers, a computer or other objects, in addition to a tilt-adjustable keyboard tray. 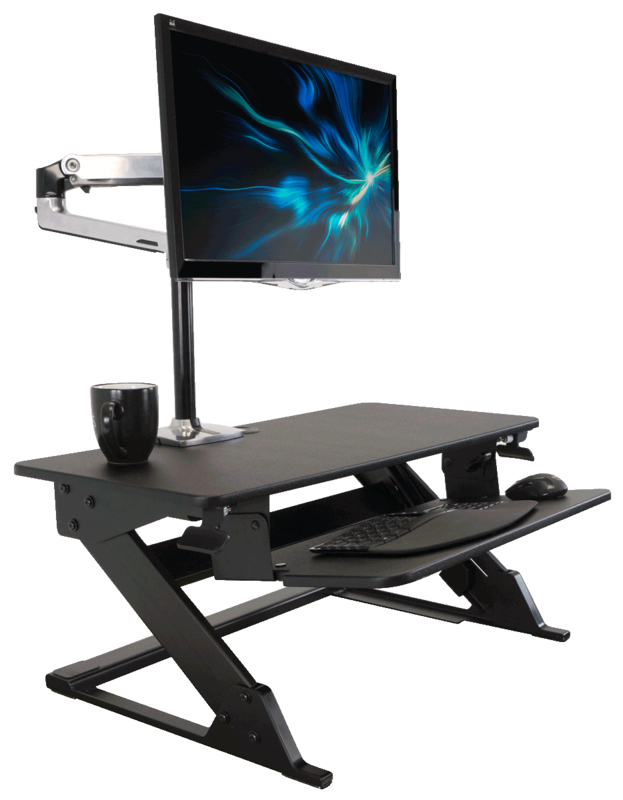 The Cadence can handle up to 25 lbs of equipment and can mount on either 24” or 30”-deep desks. It is popular with utilities, government offices, healthcare administration and accounting firms, where paper flow is still king. The Cadence Express is a lighter and smaller version of the Cadence, with a single work surface that can hold papers as well as the keyboard. It is popular in reception areas, hotel and restaurant check-ins, podiums, etc., and for use with smaller desks. 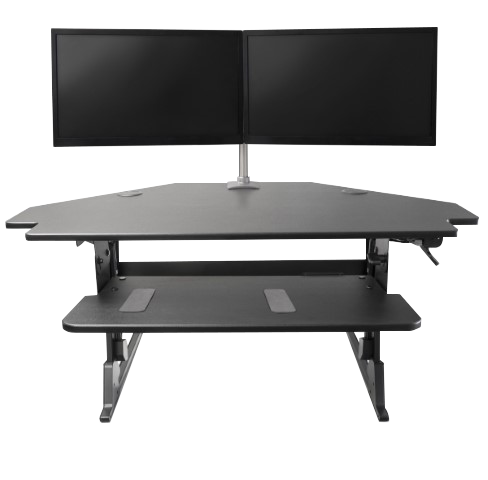 Like the Cadence, the Express can also mount to either 24” or 30”-deep desks, but is generally more “svelte” in physical size and appearance. Hovering converters are also very popular with users who need to collaborate with co-workers and clients, making it easy to look at the same monitor(s) together while sitting or standing. The Cadence is available in black, silver, or white finishes and the Cadence Express is available in black or silver. Prices include FREE shipping. Modest assembly is required – see the installation videos and documentation for the Cadence and Cadence Express. 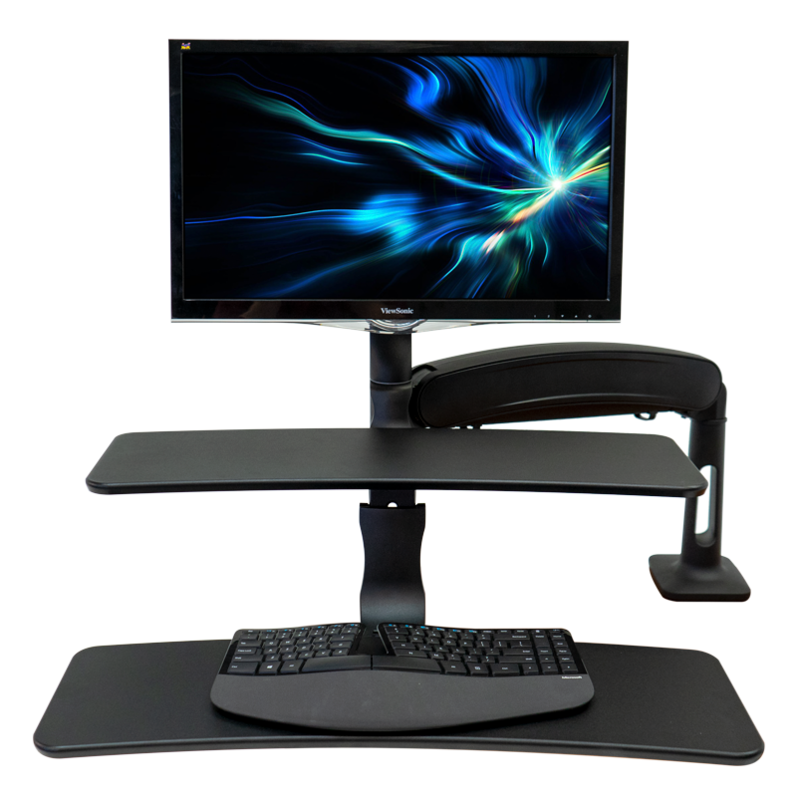 All iMovR standing desk converters are backed by a 5-YEAR warranty and our 100-day Complete Satisfaction Guarantee. 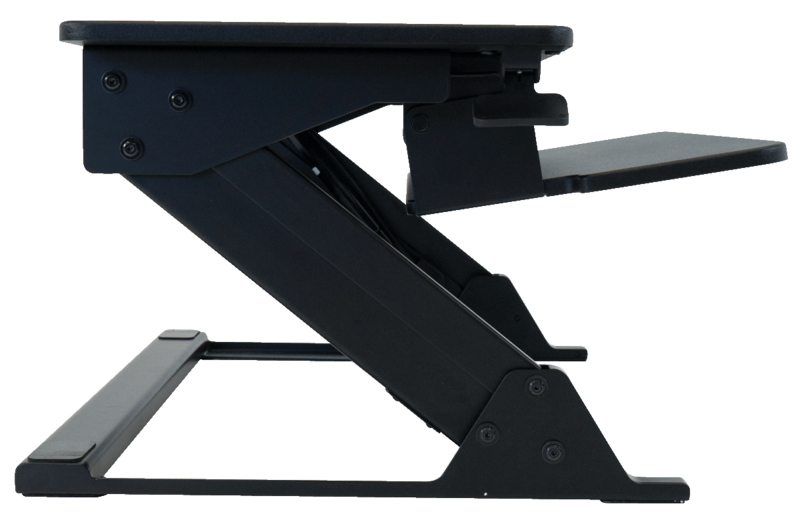 *An important thing to verify when selecting a standing desk converter is its counterbalance force. This is different from the weight lifting capacity of the unit, which is usually 2x the counterbalance force. 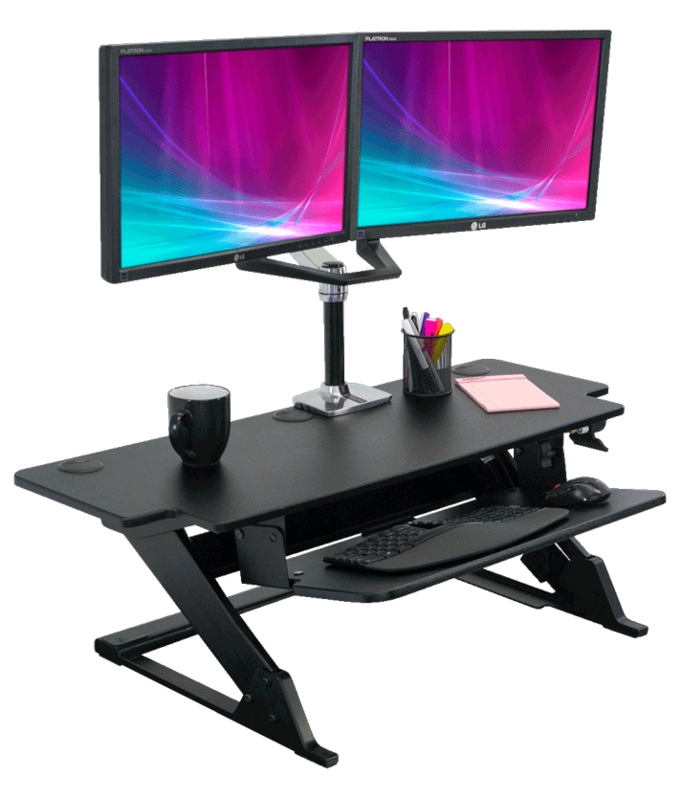 For example, if you have 30 lbs of monitors, monitor arms, computer equipment, etc., you’ll want a standing desk converter with 15 lbs of counterbalance force to make it as easy to lift the desk to standing height as it is to bring it back down to sitting height.